The ApoA1 kit is designed for the simple quantification of ApoA1 in cell-based formats. Apolipoproteins are proteins that bind to lipids to form lipoproteins, whose main function is to transport lipids. Apolipoproteins are important in maintaining the structural integrity and solubility of lipoproteins, and play an important role in lipoprotein receptor recognition and regulation of certain enzymes in lipoprotein metabolism. ApoA1 is the major protein component of high-density lipoprotein (HDL). Deficiency of ApoA1 is associated with HDL deficiencies, including systemic non-neuropathic amyloidosis. ApoA1 may also have a role in protection against Alzheimer's disease. The Apolipoprotein A1 assay is a sandwich immunoassay involving two monoclonal antibodies, one labelled with Eu-Cryptate (Donor) and the second with d2 (Acceptor). The intensity of the signal is proportional to the concentration of apolipoprotein present in the sample. 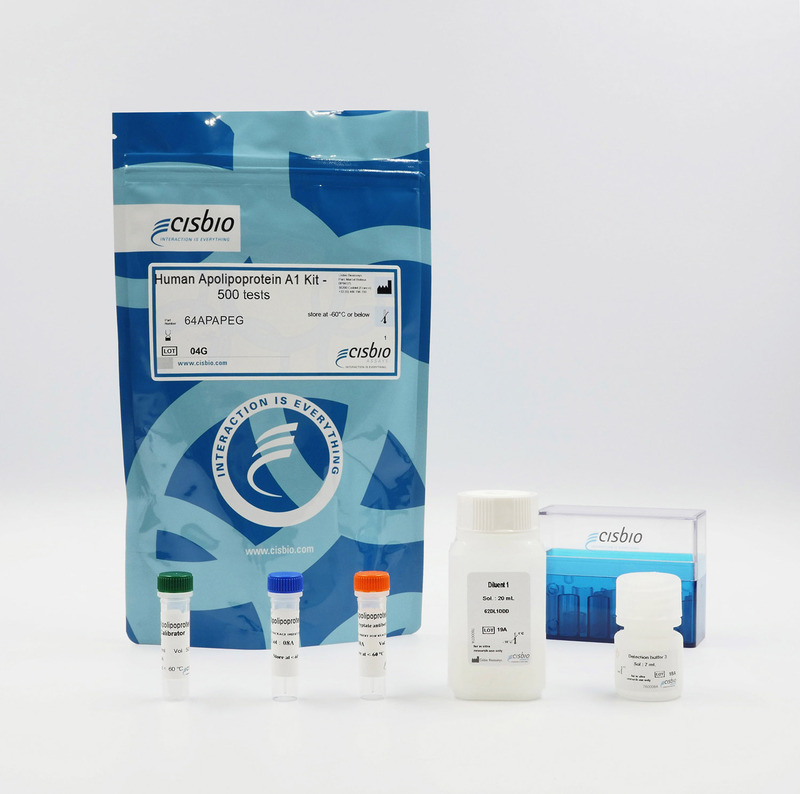 The ApoA1 assay features a streamlined protocol with only one incubation step following the sample/calibrator and Antibody conjugates dispensing. The antibodies labelled with HTRF donor and acceptor may be pre-mixed and added in a single dispensing step to further streamline the assay procedure. This protocol requires a single 2-hour incubation period at RT. Human hepatoma cells (HepG2) in 80-90% confluence were grown in DMEM (Gibco; 11885, low glucose) supplemented with 2% FBS. 5 µL of HepG2 cells (2,000 & 5,000 per well) and 5 µL of the RXR ligand 9-cis retinoic acid (9-cis-RA) in DMEM, 2% FBS at various concentrations were dispensed into a 384-well low volume black culture plate. After a 48 hour incubation at 37°C in CO2 atmosphere, 10 µL of the two pre-mixed detection reagents were added.